How did a game called Blood Bowl take this long to introduce an all-vampire team, and why aren't they turning to dust during day games? The Blood Bowl Legendary Edition is on track for release at the end of this month, which seems like as good a time as any to introduce the bloodsucking undead menace known as the Vampire team. Judging by these screens, these are special day-walking vampires, so like Blade they have all of the vampire strengths, and none of their weaknesses. They can even hypnotize the opposing team! Of course some of your team members might get hungry and wander off the field to eat the cheering section, but that's a small price to pay for eternal life and the championship trophy. 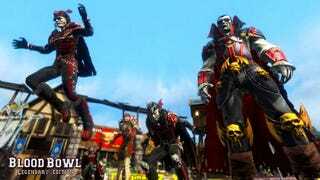 Vampires are one of the 11 new playable teams coming in the Blood Bowl Legendary Edition for PC on October 28.